Major failure though. You have to pay more. That's what all this watch business is about. Accurate time is cheap. Are you being late for meetings often? Maybe someone tries to send you a message? Is that your inbox? Wow. But don't feel bad, I don't receive those 87% off mails, but I get a quite a few fake Blizzard-World of Warcraft every day. Most of them can slip through the spam filter because they are too generic and not distinguishable enough from real mails. 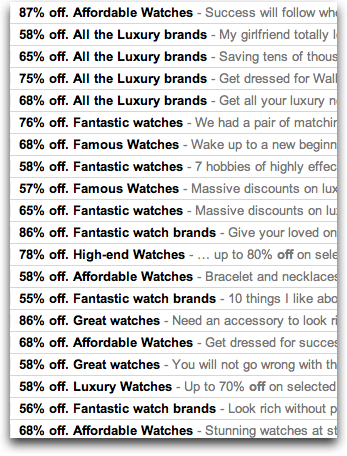 No, that's the GMail spam folder with a search for "% off". Hmm - I got a load of the same mails. But they were giving you better deals than me - the injustice of it! !